The third and final leg of the coveted Triple Crown of thoroughbred horse racing is the famous Belmont Stakes that is held at Belmont Park every year in June. The Belmont Stakes is a grade 1 stakes race for 3 year old thoroughbred colts, geldings and fillies. Colts and geldings carry a weight of 126 pounds and fillies 121 pounds. 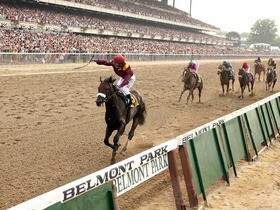 The Belmont follows the Kentucky Derby by 5 weeks and the Preakness Stakes by 3 weeks and is always held on a Saturday. It is one of the most popular races in the United States and indeed ranks 4th among all races in North America. The very 1st Belmont Stakes was held in 1866 at Jerome Park Racetrack, a venue that was financed by August Belmont, Sr. and after whom the race was named. It was held there until 1890, moved to Morris Park Racecourse for 15 years, and then moved again to the new Belmont Park that opened in 1905 in Elmont, New York. The new course was just outside of Queens, NY on Long Island and was 430 acres in size. CheapTicketsASAP.com acts as an intermediary between buyers and ticket sellers to facilitate the purchase and sale of Belmont Stakes tickets, and as such is not directly involved in the actual ticket sale transaction between the buyers and TICKET SELLERS. All sales are final. As tickets sold through CheapTicketsASAP.com are often obtained through the secondary market and prices are determined by the individual seller, the prices for tickets may be above or below face value. Belmont Stakes Tickets sold through CheapTicketsASAP.com are from a third party; therefore, the buyer's name will not be printed on the tickets. Tickets may be sent by email when stated so. Please note that the name on the tickets does not affect the buyer's ability to access the Belmont Stakes event.